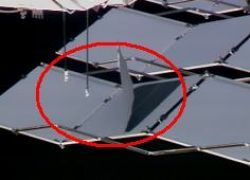 Imagery taken of the delaminated panel on the International Space Station’s S1 Radiator has revealed a “structural risk” on the array, which has the potential to create an ammonia leak in the External Thermal Control System (ETCS). NASA managers are considering options that include flying a replacement radiator array on a downstream shuttle mission, along with bringing the damaged S1 Radiator back to Earth. Imagery found that one of the eight radiator panels on the S1 array – which each have two thermal face sheets, one on each side, epoxy-glued and autoclaved to the honeycomb structure of the radiator – was observed as peeled back. These face sheets have a thermal surface coating designed to maximize heat reflection and absorption transfer to space. The radiators are used to remove heat from the Station, via a loop filled with ammonia, supplied by the ETCS accumulator, and backed up by the Ammonia Tank Assembly (ATA). Though the cause of the damage has not been confirmed, the survey was called after Russian spacewalkers reported one of the Service Module thruster covers had impacted the S1 radiator, after it was jettisoned during a spacewalk last year, making it the leading candidate – especially since all the other panels remain in good shape. However, Station managers decided to utlize STS-119’s EVA time to take a closer look. This task remained, despite Discovery’s mission content being reduced by one EVA. During STS-119’s EVA-2, the spacewalkers took photography – including thermal imagery – of the panels to check for hot spots and allow for a closer inspection of the damage on the ground. Those evaluations have taken place and have revealed the issue as potentially serious. “S1-3-2 Radiator Peeled Back Panel Status: Engineering and Boeing brought in a status of this situation,” noted an expansive ISS update in this week’s Space Station Program Control Board (SSPCB) meeting notes, available on L2 – before outlining some of the basics of the radiator system. “The board was reminded that the Ammonia Tank Assembly (ATA) acts as an accumulator for the ETCS system. The built in ETCS accumulator does not have sufficient volume to be able to react to the orbital thermal environmental variation with the ATA supply valves closed. “At this point, the structures folks indicated that with a single panel peeled back from the S1-3-2 radiator, general on orbit load cycles are now reacted at ammonia flow tube weld joints vs the skin of the panel. The report went on to outline the impacts of a leak in the loop, noting the ISS crew would be alerted by their Failure Detection, Isolation and Recovery (FDIR) system during such an event, in turn allowing for either the crew or controllers on the ground to isolate the leak. “(However,) the board was reminded that the current FDIR only alerts the crew or ground to a potential ammonia leak when the accumulator pressure drops to 170 psia to protect the pump. “Since there is an accumulator at the pump assembly, the entire ATA tank would be emptied prior to auto FDIR annunciating the problem and shutting down the loop. Once notified of a leak, it takes the crew around 30 minutes to manually isolate a radiator panel or the MCC around 15 minutes. Should such an event take place, the Station would not be without a full supply of ammonia for long, with STS-128/17A due to carry a new ATA to the ISS this summer – a regular changeout, with another ATA set to fly on STS-131. 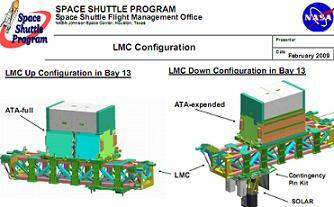 However, managers are required to work options for at least the interim, which includes flying a spare radiator – likely to be a full S1 replacement – on a future shuttle mission. That option includes bringing back the current S1 radiator system for evaluation of root cause on the ground – allowing for important lessons learned as the ISS heads into the next decade. “The board gave several actions. First was to see what it would take to fly a spare to orbit and perform an R&R (Removal and Replacement) and to bring back the failed system to determine the root cause,” added the report. “Second, was to determine what it would take to ensure that the community was OK with venting this particular panel in the near future to protect for a loop leak. “Third, was to investigate potential software changes, hazard waivers, etc to help MOD and the crew detect and isolate failures to individual panels with minimal loss of ammonia. Such issues once again highlight how the proposed shuttle extension may provide a major benefit to the ISS, with not only the ability to carry major replacement hardware to orbit, but also the down mass capability that may be called upon, as seen with the potential option to bring the S1 Radiator back to Earth.